When looking for activities to do with older youth, hopefully Community Service will be at the top of the list! Working together, kids learn to solve problems and make decisions and successfully contribute to their community. They connect local concerns with global issues and gain an awareness of others. All this will serve them now and years later as they transition out of school and into the adult world! 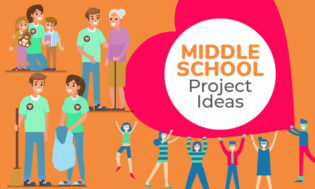 CHECK OUT THE TONS OF IDEAS IN Community Service Project Ideas for all Ages! THEY ALSO WORK FOR MIDDLE AND HIGH SCHOOL! Set up a Help-O-Meter to keep track of the number of hours youth in your program volunteer. Make a gift for the secretary of a non-profit organization. Take photos during an event and donate them to the event organizers. Design a campaign to promote tolerance and understanding of differences. Volunteer at a health fair. Volunteer as a counselor at local summer camp. Volunteer to do office work at a local non-profit agency. Volunteer to lead a club or share a talent by teaching a class for younger kids. Run or walk in a charity race with friends. Volunteer to help at charity auctions. Take a life saving class. Create a play that teaches young children how to stay safe at home. Pet Therapy is a great project for brightening the day of nursing home residents who may not get much company. Set up a visit with your local nursing home and simply take your pets along for the residents to enjoy. It offers them some great company and a cuddly, affectionate cat, dog or other friendly animal to pet. 16. Assist in a shelter day-care room – taking care of children while parents look for jobs. 17. Make first aid kits for homeless shelters. 19. Help cook and/or serve a meal at homeless shelter. 20. Gather clothing from your neighbors and donate it to a local shelter. 21. Make “I Care” kits with combs, toothbrushes, shampoo, etc. for homeless people. 22. Make a care package with mittens, socks, T-shirts, etc. for a child at a homeless shelter. 23. Clip coupons and give them at your local food pantry or homeless shelter. 24. Pack and hand out food at a food bank. 25. Organize a neighborhood group to plant, tend and harvest a vegetable garden; donate the produce to a food bank. 26. Sponsor a food drive at your school or parent’s workplace or business. 27. Bake a batch of cookies and deliver them to a soup kitchen or homeless shelter. 28. Raid your closet and attic to find toys and clothes to donate to a homeless shelter. 29. Assist with sorting and organizing items donated to a homeless shelter. …..Assist in a shelter day-care room, taking care of children while parents look for jobs. 31. Become a Big Buddy for one or more of the children at the homeless shelter. Too old for child care and too young to work! When youth “age out” of a school-age care summer program, these 13-15 year olds may be left home alone for the long summer days. One win-win solution: create a YOUTH VOLUNTEER STAFF PROGRAM that offers a safe, familiar place where teens can offer assistance while working alongside their friends. The AppleCorps program, a program for 13-15 year olds created by the Applewood Learning Center in New Hampshire, is profiled in the March/April 2008 issue of Exchange Magazine. Created during a campaign to make the center more family friendly, teens volunteer in the program and parents/families pay a minimal fee to cover the cost of uniform shirts. Youth must complete a written application, attend an orientation session, meet with the Head Teachers and agree to be assigned to a classroom without their friends so that their primary focus is on the children. 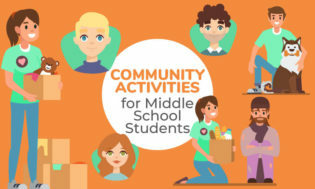 Teen responsibilities include reading to children, participating in activities, comforting upset children, preparing snacks, organizing library spaces and emptying recycling bins. An office was created for the AppleCorps volunteers where they can take breaks and organize their work. Youth also participate in center-wide jobs in the afternoon so that they can “hang out” together. Volunteer opportunities at the program have now expanded to include GrandApples for grandparents of enrolled children. Remember…ALL IDEAS IN THE Community Service Project Ideas for all Ages! CATEGORY– ARE GREAT FOR MIDDLE AND HIGH SCHOOL! Be sure to check it out! School is an introduction to the greater world in so many ways, including how to bridge age and cultural differences. One group of 7th and 8th graders collaborated with 1st graders in an ongoing, multi-faceted project to do just that. • Following a comprehensive training on communication, tutoring, and group work, the 7th and 8th graders began to work extensively with 1st graders in their district. The older students studied a variety of world cultures, then designed and facilitated presentations and activities for the younger students during such observations as Asian New Year, Cinco de Mayo, and Earth Day. • For their part, the 1st graders learned numbers and basic greetings in several languages and taught these to the older students. Both groups also participated in longer term efforts such as peer tutoring. • As they progressed through their project, all the students involved worked to develop and maintain a resource file. They stored copies of their research, activity plans, and contacts from which community members could draw. Adapted from Route to Reform: K-8 service-learning Curriculum Ideas, © 1994-95 National Youth Leadership Council. 34. Acceptance is key in the fight against HIV and AIDS. One group realized this after reading a book about pandemics and society’s negative views of the infected. The students formed groups to determine ways of counteracting harassment within theirschool. The strategies they developed and executed included public service announcements, policy meetings with school officials, a proposal for “safe school guidelines,” and a teach-in featuring music and poetry about tolerance among teens. Post-service reflection included the students writing and conducting a survey to learn whether their efforts were effective. Adapted from “The Complete Guide to Service-Learning,” Copyright 2004 Cathryn Berger Kaye. Students of Delton-Kellogg High School (DKHS) in Michigan have been working together to serve their community—particularly the low-income residents, with needed car maintenance and free oil changes. An estimated 300+ students were involved in this service-learning project to provide 50 free oil changes to those who might not otherwise be able to afford it. More experienced students from the auto-shop class paired up with first year students, under the supervision of the instructor to change oil, replace oil filters, top-off fluids and make referrals for any additional car maintenance. National Honor Society students helped screen potential recipients and record the necessary information so appointments can be made. Other student volunteers were on hand to help entertain younger kids and keep them away from dangerous tools and chemicals. Business class students helped in contacting local area businesses to solicit donated items such as car-care merchandise and food-related items that can be given to customers. Journalism students were involved in pre-event and post-event article writing and contact newspapers. A celebration of Earth Day became a sustained commitment to caring for a rainforest. To better understand tropical plants and their connections with society, the youth did research in small groups, then drew or constructed models of plants, transforming their room into a model rain forest. During their research, the students discovered they could adopt acres of the real rain forest to help preserve it, and calculated how much money they needed to do this. The students maintained their obligation to the environment in their fund-raising efforts. They created and presented, to parents and other classes, a program on dangers facing rain forests. They charged each person who attended an empty pop can, which they recycled for money to purchase sections of rain forest. As a follow-up to their presentation, the students wrote, illustrated, and bound their own story books about rain forests. They donated the books to local doctors’ offices, schools, and libraries so that the community could continue to learn about this important resource. Adapted from “Route to Reform: K-8 service-learning Curriculum Ideas,” © 1994-95 National Youth Leadership Council. This would be a great ‘Service’ activity for a classroom or middle school after-school project! A middle school’s formal student handbook didn’t fully meet students’ needs. Missing from the list of rules, regulations, and procedures was a STUDENT PERSPECTIVE on adjusting to a new school. Seventh graders felt that incoming students needed a kid-friendly handbook, written in easy-to-understand language, to supplement the formal handbook. They used the formal handbook as a resource to ensure the accuracy of essential information and designed a brainstorming exercise to determine which additional topics they would offer in the student-generated version. Students self-selected their roles as writers, typists, artists, interviewers, organizers, layout designers, and investigators. They took their responsibilities seriously, and demonstrated their commitment to the project by sharing and helping each other to achieve the common goal of a kid-friendly handbook. The student-generated handbook addresses new-student concerns such as which bathrooms to use, what’s “cool” and what’s not, and how to fit in. The guidance department now distributes it to all incoming students. Adapted from “Community Lessons: Integrating Service-Learning Into K-12 Curriculum,” 2001, Massachusetts Department of Education, Massachusetts Service Alliance, and Learn and Serve America. At the time of this writing, youth from bay area schools in Valrico, Florida have gathered for four years to bring awareness to the plight of homeless youth. Around 50 young people are estimated to participate in the 24-hour homeless simulation where they will sleep in cardboard boxes and also assemble backpacks and food packs to be donated for youth who are homeless. Participating youth learn about issues surrounding homelessness and use banners and posters to share that information with passing cars and visitors to their “cardboard” shelters. This event is organized by all youth and is open to all youth. Though their playground was filled slides, swings, and jungle gyms, 6th-grade students felt something important was missing: picnic tables. There was no place outside for students to relax and talk, eat their snacks, or play board games. In art class, the students drew a map of their playground and considered places to put picnic tables. They studied various types of trees in science class and chose the best wood for outdoor tables. The students then raised money to buy materials, recording and graphing their fund-raising progress until they had enough for four tables. Adults ran the power tools, but the students led every other part of construction, from writing, reading, and understanding instructions to measuring and hauling wooden planks. They maintained the tables for the rest of the academic year, and passed this responsibility on to the next group of students, solidifying long-lasting student involvement. In a relatively short time, these youths provided their school with a tangible contribution that would not only benefit them but future students for years to come. Adapted from “Route to Reform: K-8 service-learning Curriculum Ideas,”:1994-95 National Youth Leadership Council. 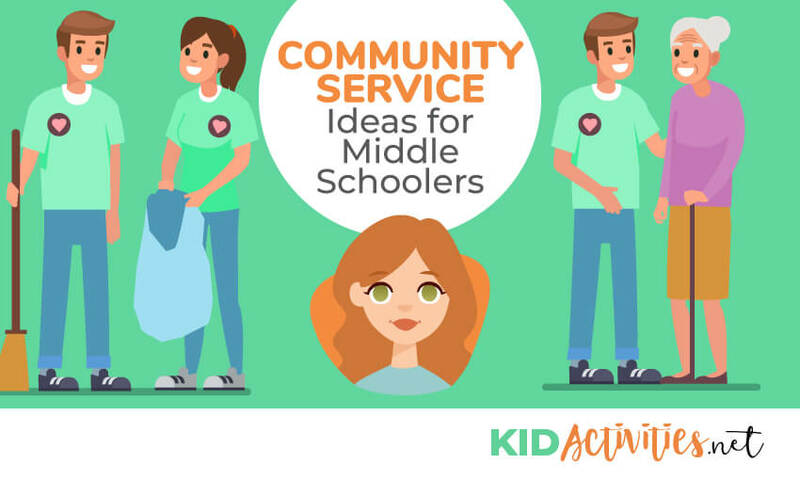 Community Service Project Ideas for all Ages!